Home » Financial News » Interest Rates: How Low Can We Go? Interest rates have hung out in historically low territory for a number of years now. And just when you thought they were hovering around rock bottom, the floor fell out again. In a surprise move earlier this year the Bank of Canada made cuts to interest rates; and now today, the Bank of Canada dropped them even further. Although it may be tempting for consumers to head out and spend, spend, spend, it seems that most Canadians are not planning on treating this rate cut as last call at the mall. 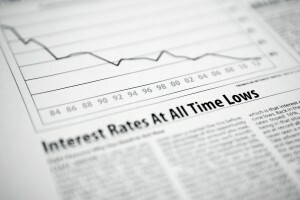 In fact, a recent poll by CIBC, done in advance of Wednesday’s rate announcement, shows that an overwhelming majority of consumers don’t intend to use this latest rate cut as an excuse to rack up the purchases; a mere 7 percent of respondents said that they’d take advantage of the rate cut to accumulate more debt. What is perhaps most encouraging from this poll was that nearly a third of respondents planned to take advantage of this rate cut in a whole other way- to pay down their existing debt loads more quickly. Join other Canadians by treating this recent rate cut as an opportunity not to buy more house or get a new car, but to work on whittling down the debt you already have. If you don’t have a plan or a household budget in place, then there is no time like the present to get going. While this message may be falling on deaf ears, because it has been repeated so often, rates will go up at some point. And those who have high debt loads are going to be in for a nasty (potentially devastating) debt surprise. Get going. Today. We all want to be able to stretch our money and give it more mileage. With this dip in interest rates, that’s precisely what has happened. Your same payments will work harder to reduce your overall debt load, because you are actually having to pay out less towards interest. If you’ve got any extra cash coming in, now is an excellent time to direct it towards debt. You may be receiving a cash injection this month from the Government in the form of the Enhanced Universal Child Care Benefit. What are your plans for it? Extra cash will go further, helping reduce the principal amount that you owe. Debt is sneaky; one day you’ve got it all under control, and seemingly the next day it’s ballooned out to massive proportions. You can take steps today to ensure that you’ve got control- and that you will maintain control in the months and years to come. Aggressively reducing your debts now means that you’re less vulnerable when (not “if”) rates go up in the future, because your payments will not increase as much as they otherwise would have. Don’t buy now and pay later. Instead, pay now so you can live your life later without the stress of unmanageable debt. Wondering how you can take advantage of lower interest rates to wipe out your debt? Call one of our trained credit counsellors 1-888-294-3130 or check out our free online debt analysis tool to get started.